Sedation Options Many of us are a little nervous about a visit to the dentist. Sometimes this perception prevents us from keeping our teeth healthy, attractive and functional. When you visit Dr. DuCoin, rest assured your comfort and safety are our highest priorities as you receive the most advanced dental care. We make sure all of your questions are answered and you understand and choose the best option to solve your dental problem. We treat the mouth and teeth, and care about you. After understanding your situation, you choose from options presented to make sure you are comfortable and relaxed during your treatment to restore you to good dental health. How can Dr. DuCoin allow me to be comfortable during treatment? In the overwhelming majority of people we treat, after a thorough explanation and understanding of the steps being taken, no additional sedatives are necessary. Of course a person never feels the actually work in your mouth due to localized anesthetic, painlessly administrated. If someone new to our practice is a little anxious, we have the tools to deal with that distress. One method is to inhale nitrous oxide and other sorts of medication so you are completely relaxed during treatment. Another method is to take a mild sedative prior to treatment, to allay any feelings of anxiety. Our top priority is to make your visit pleasant, memorable and comfortable. Call Carolyn at 772-287-6159 to schedule an appointment. 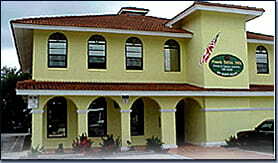 We are open from Monday to Friday from 8:30 am to 5:00 pm at 808 S E Ocean Boulevard, Stuart, FL.